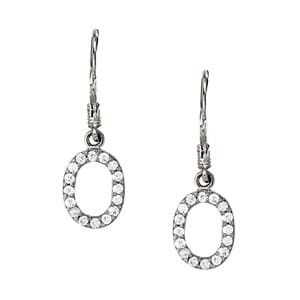 These Oval Diamond Earrings are just simple ovals set with diamond on them. They have earwire backs, but other findings could be used as well. Each earring has 1/8 of a carat of diamonds in them, but other type of stones can be used as well. I can also make Oval Diamond Earrings in any other shape you desire. Click HERE to see another pair of Diamond Earrings. Click HERE to learn more about custom jewelry, to see our portfolio, or to contact us about a pair of Oval Diamond Earrings. It can cost less than you think to have your very own set of custom earrings made just for you. Why hassle with the retail stores for boring and overpriced earwear?